On Christmas Eve last year, my husband and I dropped the older kids at my in-laws – who had requested the presence of the kids alone so they could engage in some holiday decorating and crafts – and we drove off into the frozen afternoon, the sun fading weakly in the winter sky, to go look at a dog. You might remember her from this picture. She was gorgeous. 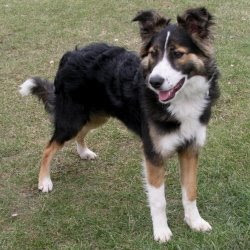 A border collie, seven months, very frisky and playful. During our hastily arranged meet-up, she jumped up and up and UP on us about 20 times. Her caretakers at the rescue organization felt her bad manners were mostly due to the fact that she’d previously been an outdoor-only dog. Her former owners had taken her to the shelter because they just didn’t have time to train her for indoor situations. Enter the Love Wells. Corey and I were starstruck with the dog. She was so pretty and so smart. She seemed excited but submissive. We felt confident that we (read: Corey) could train her up in the ways of the Lord. We were positive she would be the perfect Christmas gift for Natalie, the child who tried to kidnap friendly dogs at the park because she so desired a pet. So we agreed to pick her up on December 26. And we drove off, jubilant, to buy a dog collar and leash to wrap and put under the tree. Christmas Day turned out to be so joyfully hectic – which I think it’s a good description of any day for a family with three young children – that we never got around to giving Natalie the doggie goods. We decided, instead, to surprise her with the dog the next day, and let Christmas be about the new pink-and-glittery Bible, the Polly Pocket Yacht and overwhelming gift of Jesus. The next day, Corey took off at naptime to retrieve the dog. Operation Code Name: Sami. Because the rescue organization is based on the entire other side of the Twin Cities, it took him the better part of the day to pick up the dog, buy the necessary doggie supplies, get the dog groomed and get back home. Our hearts were full to overflowing. What parent doesn’t delight to grant their child’s lifelong dream? Too bad it would crash into a thousand jagged pieces within a matter of hours. Ahh.. can't believe you would tell a story like that with a "to be continued'!!! You are so mean to your dear, sweet, faithful blog readers! Oh no. This gave me the sinking feeling in my stomach. Be merciful, sweet Lovewell. Don't leave us too long. Oh no don't leave us hanging! That Sami is quite the beauty. I'm afraid to hear what happens next!! She sure is a gorgeous dog. You gave us a teaser around Christmas time that you would tell us this story. I've been looking forward to it ever since. Luckily I saw you in person, and you told it to me. I'm still waiting with baited breath for the conclusion. We adopted two puppies on Feb 9, born Christmas day. Bella, our girl looks alot like Sami. Bear, teh boy doesn't have all the white. She and her brother are such wonderful dogs!! I think I remember what happend but I hope not.